Those who think that the nuclear agreement with Iran’s supreme leader will blunt Ayatollah Ali Khamenei’s equating religion with fanaticism and terrorism must have missed the Ayatollah’s latest tweet. Coming as it did a day after the Ayatollah’s tweet, Sen. Orrin Hatch’s Iran speech — delivered on the Senate floor on Thursday, Sept. 10 — was an expression of American statesmanship at its best. It should leave every Utahn — indeed, every American — proud. Hatch clarified what is really at stake in this debate and turned the widespread bipartisan opposition to the president’s deal into a call for greater action. Building on the Utah legislature’s unanimous 2011 resolution that declares “the people of Utah stand with the Iranian people in their struggle for freedom, justice and peace” and denounces Iran’s supreme leader for “equating the fundamentals of religion with fraud, force, terrorism and tyranny,” Hatch refuted Khamenei’s depiction of America as a “Great Satan” and Americans and Israelis as warmongers who want to bomb Iran. 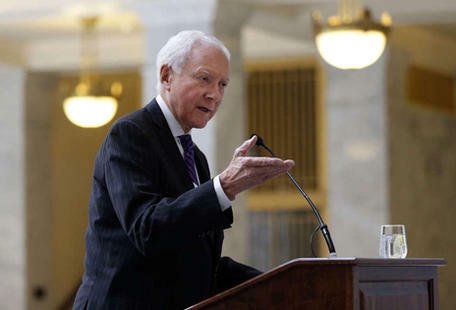 Hatch was also quick to point out that America’s quarrel is not with the Iranian people — or for that matter with Islam — but with the Ayatollah’s “dictatorial and fanatical regime,” a sentiment echoed by virtually every other senator, Republican and Democrat, and most poignantly captured by Sen. Lindsey Graham, R-S.C. Lest the warnings against the Ayatollah’s tweets and deeds be dismissed as grandstanding, the Boroumand Foundation, an Iranian human rights group, has established a cyber memorial listing the names of over 17,820 Iranians murdered by the Islamic Republic since its establishment in 1979. The actual numbers are much higher. Hatch’s willingness to challenge a theocracy founded on fear, fraud and force is a reminder of the enduring strength of American democracy. Despite the setbacks in Iraq and Afghanistan, America remains a spring of hope for our allies in the region, and for millions of Iranians who not only seek relief from sanctions and war, but from their source: an Ayatollah whose hateful tweets and deeds pose a threat to the Iranian people’s freedom, faith and future.